As a child, when asked when my birthday was, I would reply: “November 18th, the same day as Mickey Mouse’s”. On that day in 1928, some decades before I was born, I should add, “Steamboat Willy” premiered at the Colony Theatre in New York. The drawings and story were exemplary, but it was Walt Disney’s idea to add synchronised sound that was truly revolutionary. It was the first time an animated character had appeared to talk, sing and play music – and the audience gasped and cheered. In an instant, it seemed, Mickey was heading for the stars, taking with him Disney and his burgeoning studio. Despite my lifelong affinity with Mickey, it wasn’t until reading “Walt Disney’s Mickey Mouse: The Ultimate History” by David Gerstein, JB Kaufman and Daniel Kothenschulte that I realised how little I knew about him. This monster of a book (it weighs in at 5.1kg) is a minute-by-minute, lavishly illustrated account of the plucky little fellow’s first 90 years, taking in his work (with plot summaries of his films), his family (Walt Disney, the animators who drew him, and the characters he loved and fought), as well as his wider cultural significance. 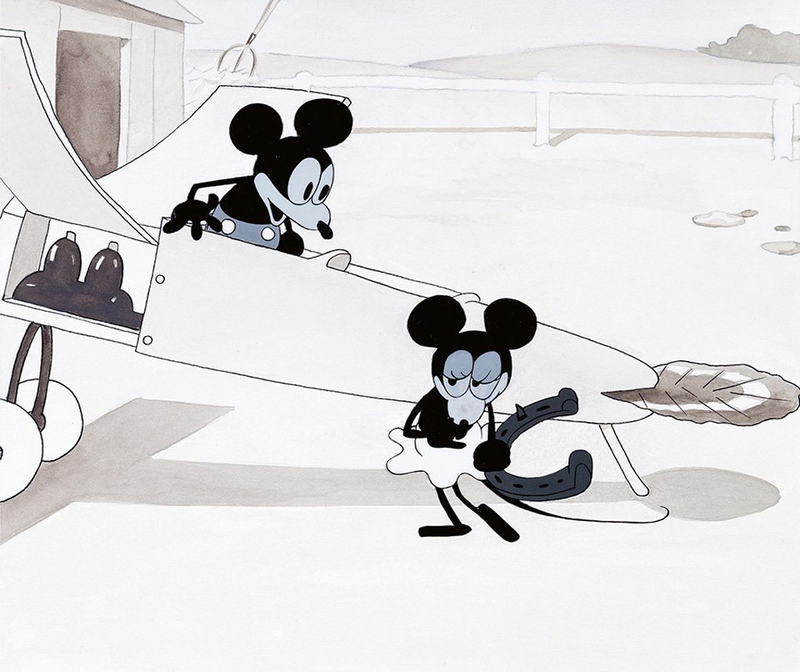 “Plane Crazy” was the first film starring Mickey Mouse to be made – though not the first to be aired. It bought into the aviation mania that had followed Charles Lindbergh’s transatlantic flight the previous year, and was put together in a few short months in early 1928. Ub Iwerks, the only animator to stay loyal to Disney after his split with his distributors, produced 700 drawings a day. In this cel (a single drawing) the prototype Mickey is a skinnier version of his later self. The scenic backdrop and the plane that he would pilot into the skies before getting distracted by the demure-looking Minnie are depicted clearly and simply. It is hard, now, to look at these monochrome characters without colouring them in, giving Mickey his red shorts and Minnie her spotty skirt and block-heeled shoes. 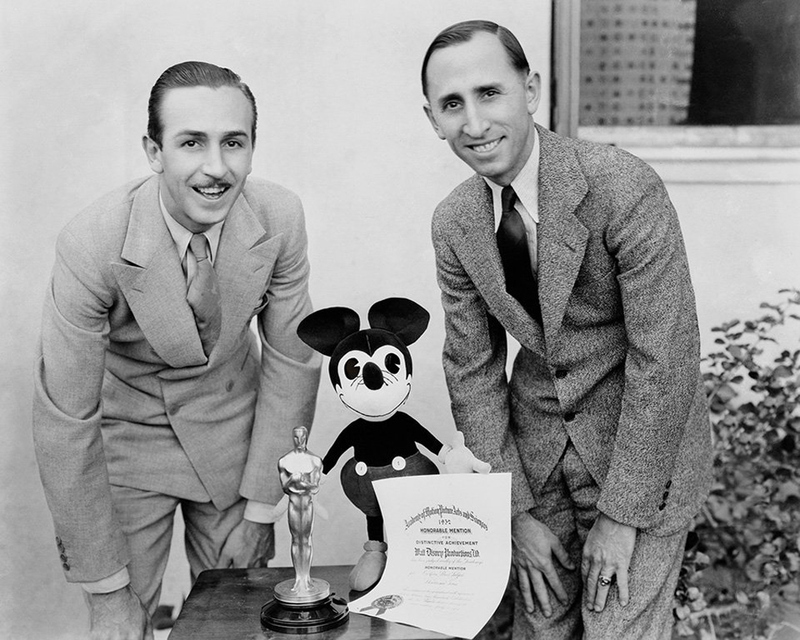 By 1932 Mickey Mouse and Walt Disney were too big to be ignored by the Academy Awards, which had, before that point, not seen cartoons as worthy of recognition. The Disney Studio made that change inevitable and at the ceremony which was held, coincidentally, on November 18th, Mickey’s birthday, Walt Disney won two Oscars, of which one was a Special Award for the creation of Mickey Mouse. In this photograph Walt (left, looking dashing with his Douglas Fairbanks moustache and double-breasted suit) and his brother, Roy, crouch down to the level of a toy Mickey. The first three-dimensional Mickey was sewn by a local woman, Charlotte Church, who brought it to the studio. Walt was so delighted by it that he rented a house nearby in which she and a group of other women started handmaking Mickey dolls. In 1935 United Artists finally granted Walt Disney the budget to colour in his creations and the world got to see the tomato-red of Mickey’s shorts for the first time. 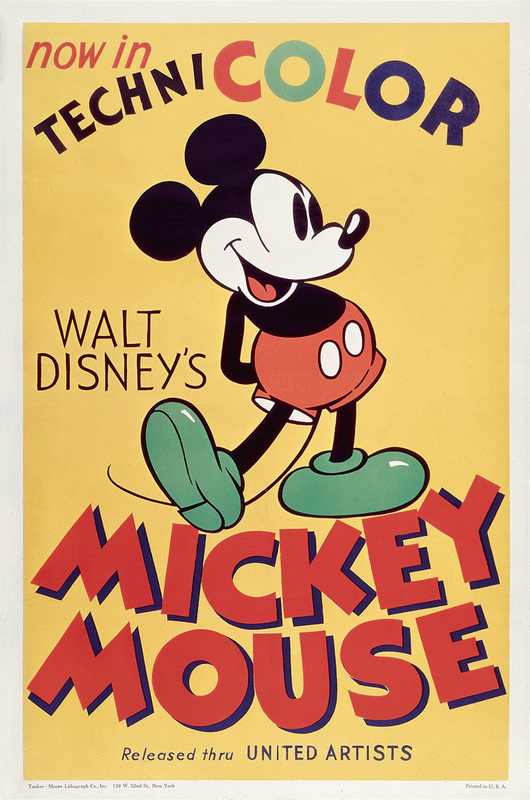 In this poster, announcing his move into glorious technicolour, Mickey Mouse’s shiny green boots take centre stage as he strikes a Fred Astaire-style pose move. In hindsight, it was perhaps a mistake to draw the attention to his feet as, soon after, the decision was taken to change the colour of his boots from green to yellow. By the mid-1930s, Mickey had grown up. 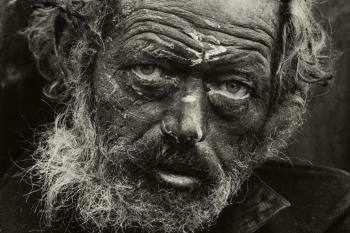 Not only was his physical figure more sophisticated – giving him some whites to his eyes, for instance, enabled more expression – but his character had matured. He was no longer so mischievous and irrepressible – character traits taken to an extreme by Donald Duck – but more of an older statesman: responsible, courteous, earnest even. The fun factor was added by the situations in which he found himself. 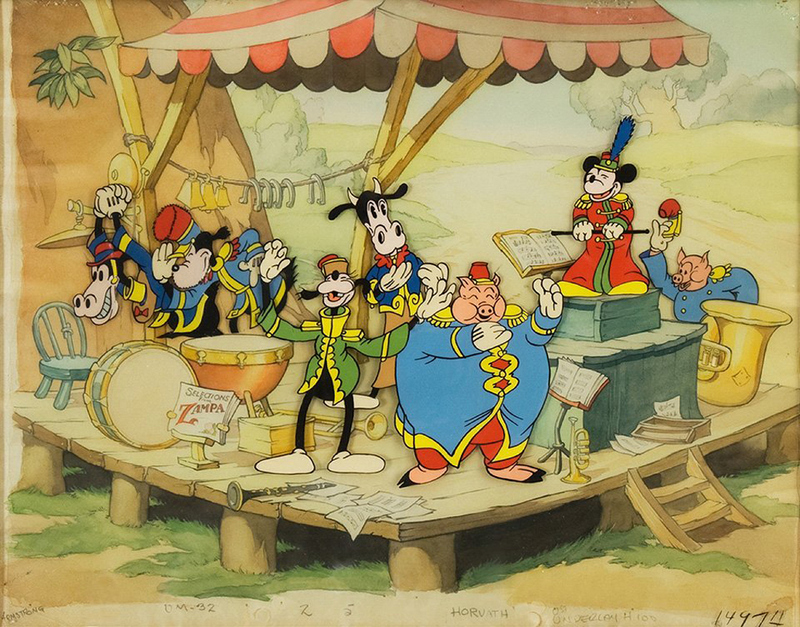 In “The Band Concert”, the first technicolour Mickey Mouse film, he is the conductor of a band, which gets hit by a tornado just as they are playing – in true meta-cinematic style – the storm section from the “William Tell Overture”. It was the most-sophisticated piece of animation yet, as can be seen from this cel. The primary palette and simple lines of the early cels have been replaced by a three-dimensional background, in dreamy watercolours and fully wrought details. Mickey Mouse was constantly changing. Fred Moore, who had started as a novice animator at the Disney Studio in the early 1930s, quickly climbed the ranks to become the person responsible for Mickey’s development. 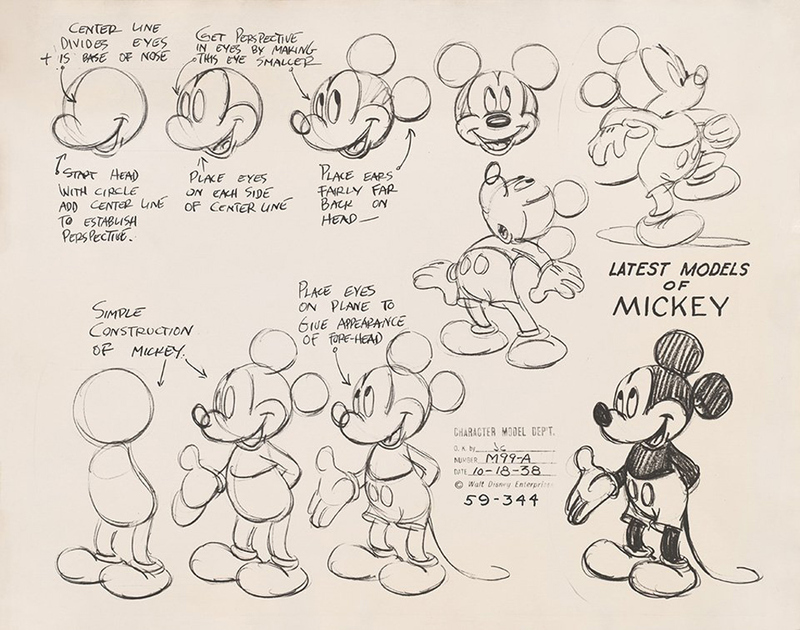 In this model sheet from 1938, he breaks down the elements of his design – from the simple circle of his head to the placings of his eyes (“on plane to give appearance of forehead”) and two-dimensional ears. Each element, on its own, is simple, but together, these pencil strokes created a multi-million-dollar industry – and a legend. 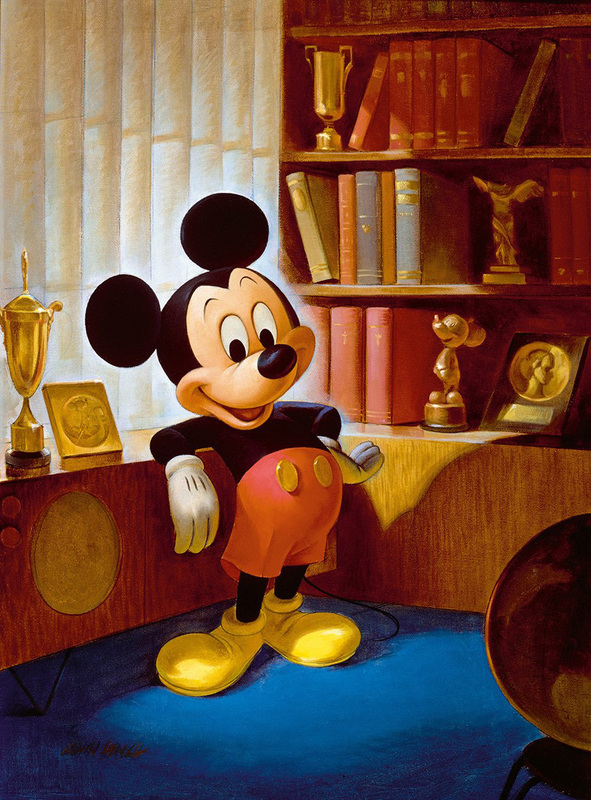 Mickey’s birthday was celebrated every year and in 1953, to celebrate his quarter-century, Mickey’s official portraitist, John Hench, painted this picture. 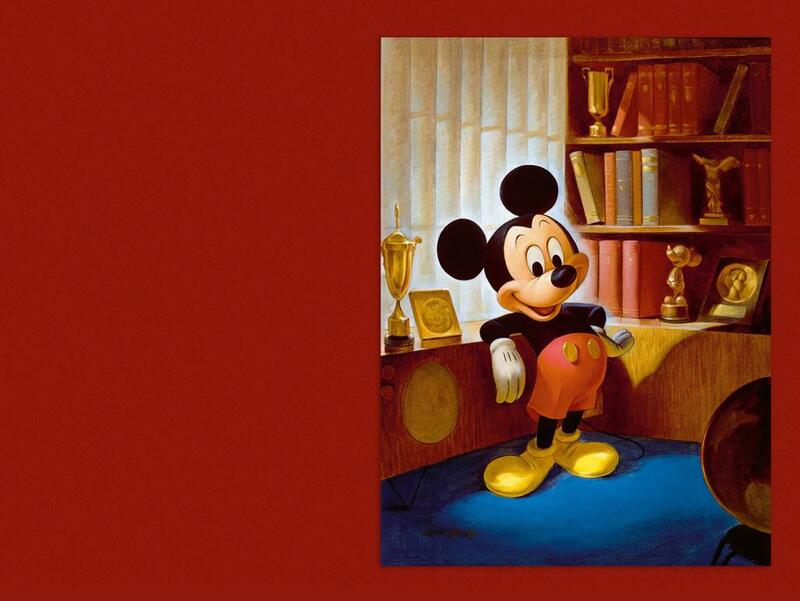 Mickey Mouse looks as perky as ever, but also just a bit smug, leaning back against a sideboard, paunch thrust out, surrounded by cups and trophies. On the shelves beside him we can see what is clearly meant to be an Academy Award, refashioned in Mickey’s image. Although he didn’t know it at the time, he was on the cusp of a major career change: from matinée idol to hotelier and host of the first Disneyland theme park. After decades of dealing with tourists in his three Disney resorts, Mickey made his television comeback in 2013, with a new series, for which he was redesigned, again. The “new” Mickey played to the prevailing appetite for vintage everything, spooling back to the original black-and-white characters. “Get a Horse”, from which this cel was taken, was promoted in advance of the premiere as a long-lost cartoon. But it was anything but. 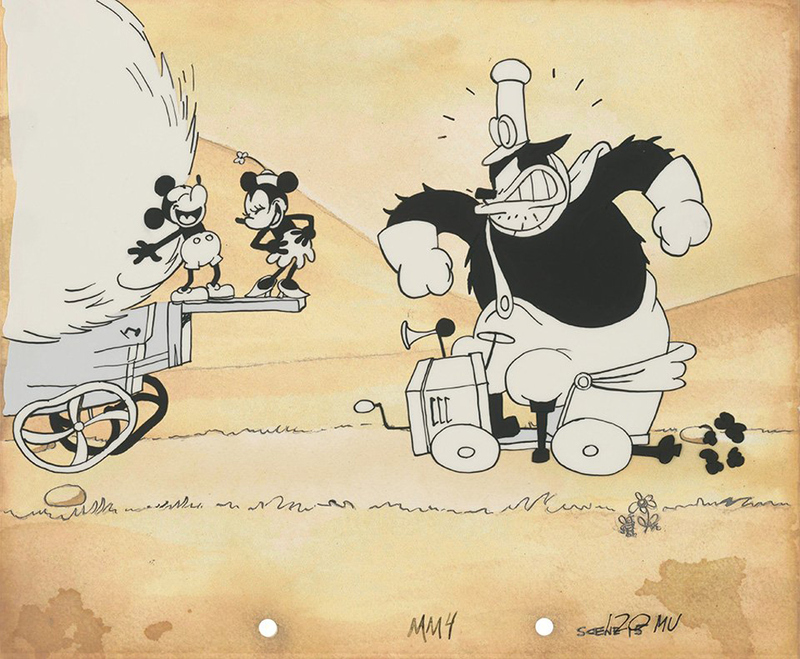 When Mickey and Minnie (and Horace the horse) came up against an angry Peg-leg Pete, the producer, Lauren McMullan, used the latest CGI effects to burst through the movie screen. It was at the same time cute and cutting edge, parachuting an octogenarian Mickey right into the 21st century. All images © Disney Enterprises Inc.